Take advantage of our home measuring, fabrication and worktop installation service in 3 easy steps. Use code INSTALL at checkout. *if the total amount of bespoke services for your order exceeds £250. **only available for the following post codes: W, WC, SW, NW, N, EC, E, SE, BR, CR, SM, KT, TW, UB, HA, WD, EN, IG, RM, DA, ME, CT, TN, BN, RH, GU, RG, SL, HP, LU, AL, SG, CM, SS. ***You live outside our installation area? We have you covered. Get £100 credit towards your purchase if you order bespoke services worth £300 or more. Use code CREDIT100 at checkout and £100 will be deducted from the total amount. Email us detailed kitchen plan and we will prepare customised DIY worktop kit, already cut, oiled and pre-fabricated for you with all fixings needed. Choose the worktops you need and add them to your shopping cart. Select fabrication services your project may require from our bespoke services section and add them to your shopping cart. 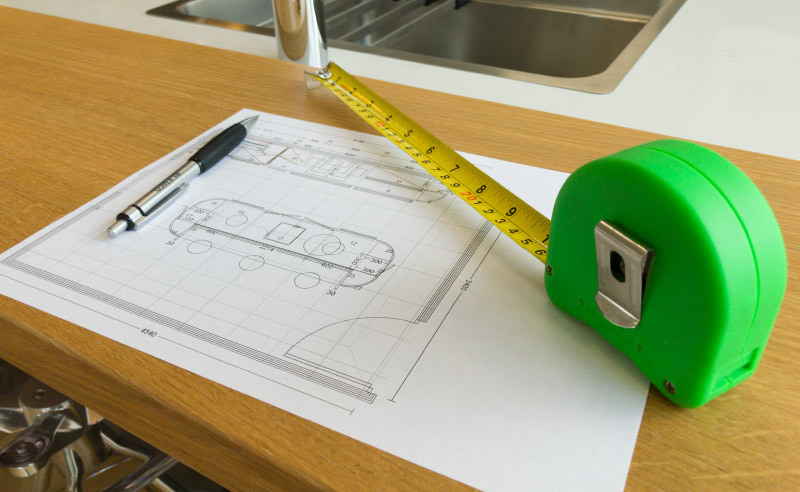 Don't forget to include home measuring and installation if you require this service and your property address is within our worktop installation area. Apply code INSTALL on checkout and complete your order. £125 will be deducted from the total amount. Job done! Start your order now. A member of our customer service team will contact you within 24 hours to discuss your order and date for template. Normally, template date is within 2-3 working days from the date of your order.